The country’s ideological divide can be measured a lot of ways, such as by votes or how people stand on issues. But it can also be seen in the news stories that people follow and, last week, conservatives were more interested in the return of the Benghazi story, while liberals focused on coverage of the kidnappings in Nigeria and the uproar over the racial comments of Los Angeles Clippers’ owner Donald Sterling. Roughly half of liberal Democrats followed news about the Nigerian kidnappings(48%) and Donald Sterling’s comments (47%) very closely. 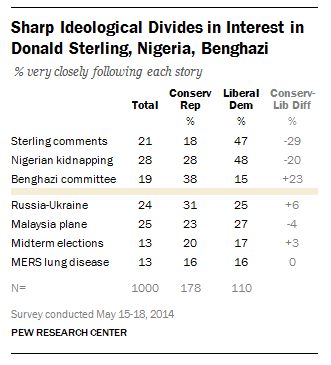 Fewer conservative Republicans paid very close attention to news about the kidnapping (28%) and Sterling’s comments (18%), according to a survey conducted May 15-18. By contrast, 38% of conservative Republicans followed news about the appointment of a new committee in the Republican-controlled House to look into the 2012 attacks in Benghazi, Libya, that killed four Americans, including the U.S. ambassador, very closely. Republicans have questioned whether the Obama administration and the State Department, then headed by Hillary Clinton, took adequate measures to safeguard the U.S. compound. When it came to the overall public, 28% said they followed the Nigerian kidnapping coverage very closely, 25% for the missing Malaysia plane, 24% for the Russia-Ukraine situation and 21% for the Sterling story. In late March, 39% had said they were following the Malaysia plane story very closely.